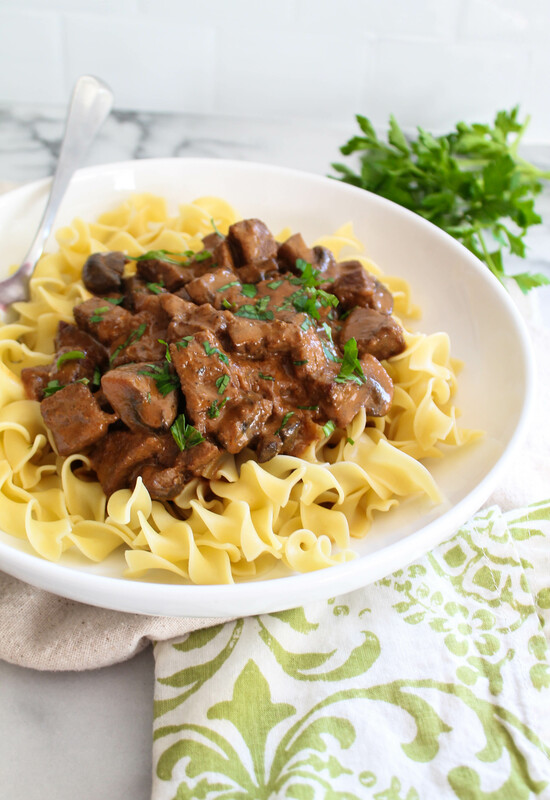 If you’ve never made Beef Stroganoff, now’s the time. It’s still cold in most of the United States and this comforting dish will have your entire family asking you for more. Mushrooms and beef come together to for a lusciously rich stew! Beef Stroganoff was not something I grew up eating in the Dominican Republic, but a dish my husband who was raised on Cape Cod was. 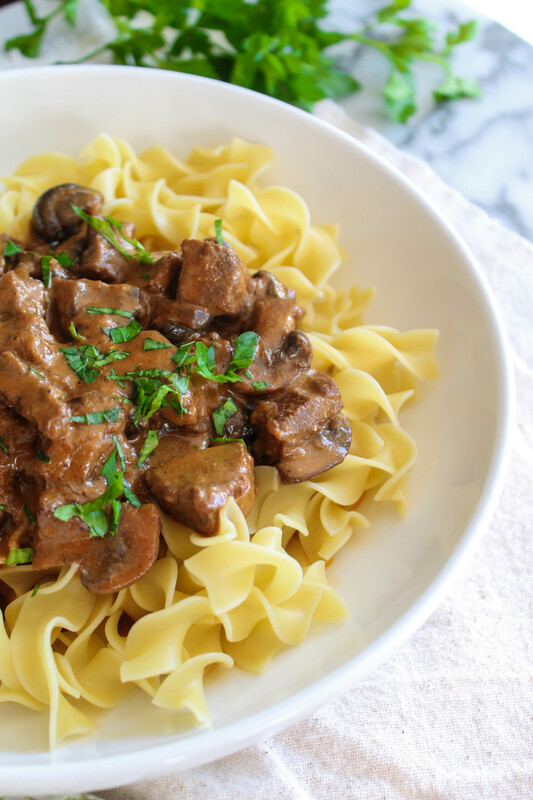 Being descendants from a variety of Eastern European countries including Ukraine and Poland, with some ties to Russia, I can see why Beef Stroganoff was a weekly dish in their childhood home. 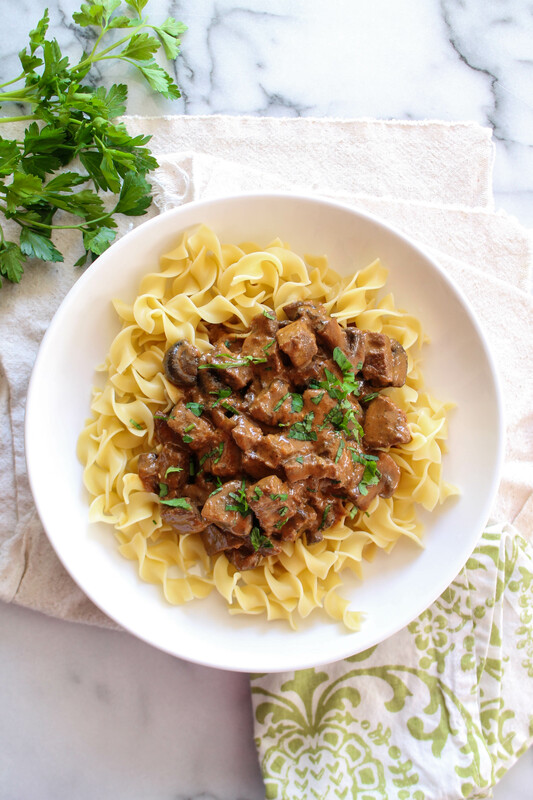 Traditionally, stroganoff is a Russian recipe of meat and mushrooms swirled in a sour cream sauce and today, we’re sticking as close to history as possible. The Larousse Gastronomique lists Stroganov as a cream, paprika, veal stock and white wine recipe. It’s also a dish made in Sweden, Brazil, Japan, and Finland. For our recipe, we’ve worked with just a few basic ingredients: beef, mushrooms, paprika, and sour cream. Combined and effortlessly coming together as a recipe that reminds you of simpler times. Once the beef and mushrooms cook and are ready to serve, the fact that sour cream is swirled into the mix to create the most flavorful sauce ever, just makes me jump for joy. It’s just the right touch of creaminess this recipe needs and since it is originated in Russia, I can understand the affinity for sour cream. Recreate this recipe at home this week and let me know what you server it with. Egg noodles are traditional, but I’m sure it’s just as tasty over mashed or boiled potatoes, or even rice! 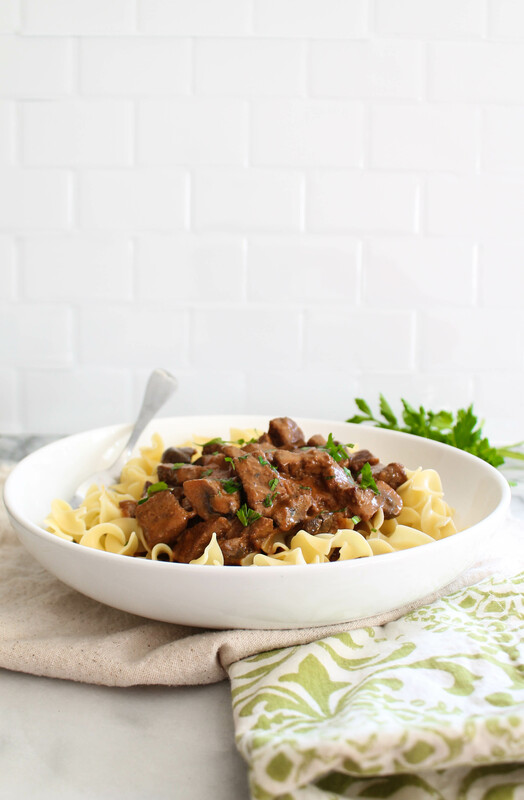 This Beef Stroganoff recipe is one for the books - super simple and the results are a comforting beef stew that when finished with sour cream, will make your stomach happy! In a stock pot, heat the oil over high heat and dump the cubes of meat in. DO NOT stir. Let the meat get a good sear on each side before disturbing - this caramelization is important to the final flavor in the stew. Once all the meat is seared, add the flour to toss the meat in it, remove from pot, lower heat to medium. Quarter and add the mushrooms and onions. Cook for 10-15 minutes until water evaporates from mushrooms. Add garlic and dry seasonings to coat and cook for 3 more minutes. Add the beef broth and dump the seared meat back in. Cook for one hour over low heat. Once ready to serve, remove from heat and stir in sour cream. Serve over egg noodles with a sprinkling of fresh herbs like parsley.